ULTIVA exposes patients and other users to the risks of opioid addiction, abuse, and misuse, which can lead to overdose and death. Assess each patient’s risk prior to prescribing ULTIVA [see Warnings and Precautions (5.1)]. These highlights do not include all the information needed to use ULTIVA safely and effectively. See full prescribing information for ULTIVA. Monitor patients closely for respiratory depression when initiating therapy and following dosage increases with ULTIVA and adjust the dosage accordingly [see Warnings and Precautions (5.2)]. ULTIVA should not be administered without dilution. Consider an alternative to ULTIVA for patients taking mixed agonist/antagonist and partial agonist opioid analgesics due to reduced analgesic effect or potential withdrawal symptoms. If concomitant use is warranted, carefully observe the patient, particularly during treatment initiation and dose adjustment. Discontinue ULTIVA if patient is not responding appropriately to treatment. ULTIVA should not be used as a sole agent for induction of anesthesia because loss of consciousness cannot be assured and because of a high incidence of apnea, muscle rigidity, and tachycardia. After endotracheal intubation, the infusion rate of ULTIVA should be decreased in accordance with the dosing guidelines in Tables 1 (adults, predominately ASA physical status I, II, or III) and 2 (pediatric patients). Due to the fast onset and short duration of action of ULTIVA, the rate of administration during anesthesia can be titrated upward in 25% to 100% increments in adult patients or up to 50% increments in pediatric patients, or downward in 25% to 50% decrements every 2 to 5 minutes to attain the desired level of µ-opioid effect. An initial dose of 1 mcg/kg may be administered over 30 to 60 seconds. Table 2 summarizes the recommended doses in pediatric patients, predominantly ASA physical status I, II, or III. In pediatric patients, remifentanil was administered with nitrous oxide or nitrous oxide in combination with halothane, sevoflurane, or isoflurane. The use of atropine may blunt the potential for bradycardia that can occur upon administration of ULTIVA. Boluses of 1 mcg/kg were studied in ASA 1 and 2, full-term patients weighing at least 2500 gm, undergoing pyloromyotomy who received pretreatment with atropine. Neonates receiving supplementation with potent inhalation agents or neuraxial anesthesia, those with significant co-morbidities or undergoing significant fluid shifts, or those who have not been pretreated with atropine, may require smaller bolus doses to avoid hypotension and/or bradycardia. Infusions of ULTIVA may be continued into the immediate postoperative period for select patients for whom later transition to longer acting analgesics may be desired. ULTIVA has not been studied in pediatric patients for use in the immediate postoperative period. The use of bolus injections of ULTIVA to treat pain during the postoperative period is not recommended. When used as an IV analgesic in the immediate postoperative period, ULTIVA should be initially administered by continuous infusion at a rate of 0.1 mcg/kg/min. Due to the rapid offset of action of ULTIVA, no residual analgesic activity will be present within 5 to 10 minutes after discontinuation. For patients undergoing surgical procedures where postoperative pain is generally anticipated, alternative analgesics should be administered prior to discontinuation of ULTIVA. The choice of analgesic should be appropriate for the patient's surgical procedure and the level of follow-up care [see Clinical Studies (14)]. ULTIVA has not been studied for use in children in monitored anesthesia care. A single IV dose of 0.5 to 1 mcg/kg over 30 to 60 seconds of ULTIVA may be given 90 seconds before the placement of the local or regional anesthetic block [see Warnings and Precautions (5.6)]. When used alone as an IV analgesic component of monitored anesthesia care, ULTIVA should be initially administered by continuous infusion at a rate of 0.1 mcg/kg/min beginning 5 minutes before placement of the local or regional anesthetic block. Because of the risk for hypoventilation, the infusion rate of ULTIVA should be decreased to 0.05 mcg/kg/min following placement of the block. Bolus doses of ULTIVA administered simultaneously with a continuous infusion of ULTIVA to spontaneously breathing patients are not recommended. For patients undergoing surgical procedures where postoperative pain is generally anticipated, alternative analgesics should be administered prior to discontinuation of ULTIVA. The choice of analgesic should be appropriate for the patient's surgical procedure and the level of follow-up care [see Clinical Studies (14)]. The starting doses of ULTIVA should be decreased by 50% in elderly patients (> 65 years). ULTIVA should then be cautiously titrated to effect [see Use in Specific Populations (8.5)]. See Clinical Studies: Coronary Artery Bypass Surgery subsection (14.5) for concomitant medication regimens. The starting doses of ULTIVA should be based on ideal body weight (IBW) in obese patients (greater than 30% over their IBW) [see Use in Specific Populations (8.6)]. ULTIVA should be diluted to a recommended final concentration of 20, 25, 50, or 250 mcg/mL prior to administration (see Table 5). ULTIVA should not be administered without dilution. When ULTIVA is used as an analgesic component of monitored analgesia care, a final concentration of 25 mcg/mL is recommended. When ULTIVA is used for pediatric patients 1 year of age and older, a final concentration of 20 or 25 mcg/mL is recommended. Table 7 is a guideline for milliliter-per-hour delivery for a solution of 20 mcg/mL with an infusion device. ULTIVA is stable for 24 hours at room temperature after reconstitution and further dilution to concentrations of 20 to 250 mcg/mL with the IV fluids listed below. 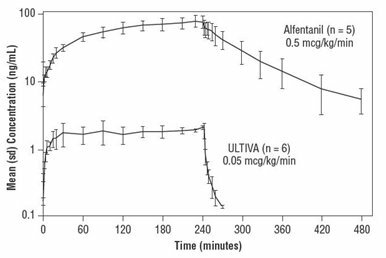 ULTIVA is stable for 4 hours at room temperature after reconstitution and further dilution to concentrations of 20 to 250 mcg/mL with Lactated Ringer's Injection, USP. ULTIVA has been shown to be compatible with these IV fluids when coadministered into a running IV administration set. ULTIVA has been shown to be compatible with Diprivan® (propofol) Injection when coadministered into a running IV administration set. The compatibility of ULTIVA with other therapeutic agents has not been evaluated. Nonspecific esterases in blood products may lead to the hydrolysis of remifentanil to its carboxylic acid metabolite. Therefore, administration of ULTIVA into the same IV tubing with blood is not recommended. ULTIVA does not contain any antimicrobial preservative and thus care must be taken to assure the sterility of prepared solutions. ULTIVA contains remifentanil, a Schedule II controlled substance. As an opioid, ULTIVA exposes users to the risks of addiction, abuse, and misuse [see Drug Abuse and Dependence (9)]. Opioids are sought by drug abusers and people with addiction disorders and are subject to criminal diversion. Consider these risks when handling ULTIVA. Strategies to reduce these risks include proper product storage and control practices for a C-II drug. Contact local state professional licensing board or state controlled substances authority for information on how to prevent and detect abuse or diversion of this product. ULTIVA should be administered only by persons specifically trained in the use of anesthetic drugs and the management of the respiratory effects of potent opioids, including respiration and cardiac resuscitation of patients in the age group being treated. Such training must include the establishment and maintenance of a patent airway and assisted ventilation. Resuscitative and intubation equipment, oxygen, and opioid antagonists must be readily available. Respiratory depression in spontaneously breathing patients is generally managed by decreasing the rate of the infusion of ULTIVA by 50% or by temporarily discontinuing the infusion [see Overdosage (10)]. Carbon dioxide (CO2) retention from opioid-induced respiratory depression can exacerbate the sedating effects of opioids. While serious, life-threatening, or fatal respiratory depression can occur at any time during the use of ULTIVA, the risk is greatest during the initiation of therapy or following a dosage increase. Monitor patients closely for respiratory depression, especially when initiating therapy with and following dosage increases of ULTIVA. ULTIVA should not be used in diagnostic or therapeutic procedures outside the monitored anesthesia care setting. Patients receiving monitored anesthesia care should be continuously monitored by persons not involved in the conduct of the surgical or diagnostic procedure. Oxygen saturation should be monitored on a continuous basis. Patients with significant chronic obstructive pulmonary disease or cor pulmonale, and those with a substantially decreased respiratory reserve, hypoxia, hypercapnia, or pre-existing respiratory depression are at increased risk of decreased respiratory drive including apnea, even at recommended dosages of ULTIVA. Elderly, cachectic, or debilitated patients may have altered pharmacokinetics or altered clearance compared to younger, healthier patients resulting in greater risk for respiratory depression. Monitor such patients closely including vital signs, particularly when initiating and titrating ULTIVA and when ULTIVA is given concomitantly with other drugs that depress respiration. To reduce the risk of respiratory depression, proper dosing and titration of ULTIVA are essential [see Dosage and Administration (2.11)]. Hypotension, profound sedation, respiratory depression, coma, and death may result from the concomitant use of ULTIVA with benzodiazepines or other CNS depressants (e.g., non-benzodiazepine sedatives/hypnotics, anxiolytics, tranquilizers, muscle relaxants, general anesthetics,antipsychotics, other opioids, or alcohol). Patients should be advised to avoid alcohol for 24 hours after surgery [see Drug Interactions (7)]. Cases of serotonin syndrome, a potentially life-threatening condition, have been reported during concomitant use of ULTIVA with serotonergic drugs. Serotonergic drugs include selective serotonin reuptake inhibitors (SSRIs), serotonin and norepinephrine reuptake inhibitors (SNRIs), tricyclic antidepressants (TCAs), triptans, 5-HT3 receptor antagonists, drugs that affect the serotonergic neurotransmitter system (e.g., mirtazapine, trazodone, tramadol), and drugs that impair metabolism of serotonin (including MAO inhibitors, both those intended to treat psychiatric disorders and also others, such as linezolid and intravenous methylene blue) [see Drug Interactions (7)]. This may occur within the recommended dosage range. Serotonin syndrome symptoms may include mental status changes (e.g., agitation, hallucinations, coma), autonomic instability (e.g., tachycardia, labile blood pressure, hyperthermia), neuromuscular aberrations (e.g., hyperreflexia, incoordination, rigidity), and/or gastrointestinal symptoms (e.g., nausea, vomiting, diarrhea). The onset of symptoms generally occurs within several hours to a few days of concomitant use, but may occur later than that. Discontinue ULTIVA if serotonin syndrome is suspected. Continuous infusions of ULTIVA should be administered only by an infusion device. IV bolus administration of ULTIVA should be used only during the maintenance of general anesthesia. In nonintubated patients, single doses of ULTIVA should be administered over 30 to 60 seconds. Interruption of an infusion of ULTIVA will result in rapid offset of effect. Rapid clearance and lack of drug accumulation result in rapid dissipation of respiratory depressant and analgesic effects upon discontinuation of ULTIVA at recommended doses. Discontinuation of an infusion of ULTIVA should be preceded by the establishment of adequate postoperative analgesia. Injections of ULTIVA should be made into IV tubing at or close to the venous cannula. Upon discontinuation of ULTIVA, the IV tubing should be cleared to prevent the inadvertent administration of ULTIVA at a later point in time. Failure to adequately clear the IV tubing to remove residual ULTIVA has been associated with the appearance of respiratory depression, apnea, and muscle rigidity upon the administration of additional fluids or medications through the same IV tubing. Skeletal muscle rigidity can be caused by ULTIVA and is related to the dose and speed of administration. ULTIVA may cause chest wall rigidity (inability to ventilate) after single doses of > 1 mcg/kg administered over 30 to 60 seconds, or after infusion rates > 0.1 mcg/kg/min. Single doses < 1 mcg/kg may cause chest wall rigidity when given concurrently with a continuous infusion of ULTIVA. Muscle rigidity induced by ULTIVA should be managed in the context of the patient's clinical condition. Muscle rigidity occurring during the induction of anesthesia should be treated by the administration of a neuromuscular blocking agent and the concurrent induction medications and can be treated by decreasing the rate or discontinuing the infusion of ULTIVA or by administering a neuromuscular blocking agent. The neuromuscular blocking agents used should be compatible with the patient's cardiovascular status. Muscle rigidity seen during the use of ULTIVA in spontaneously breathing patients may be treated by stopping or decreasing the rate of administration of ULTIVA. Resolution of muscle rigidity after discontinuing the infusion of ULTIVA occurs within minutes. In the case of life-threatening muscle rigidity, a rapid onset neuromuscular blocker or naloxone may be administered. ULTIVA should not be administered into the same IV tubing with blood due to potential inactivation by nonspecific esterases in blood products. Bradycardia has been reported with ULTIVA and is responsive to ephedrine or anticholinergic drugs, such as atropine and glycopyrrolate. Hypotension has been reported with ULTIVA and is responsive to decreases in the administration of ULTIVA or to IV fluids or catecholamine (ephedrine, epinephrine, norepinephrine, etc.) administration. Intraoperative awareness has been reported in patients under 55 years of age when ULTIVA has been administered with propofol infusion rates of ≤ 75 mcg/kg/min. In patients who may be susceptible to the intracranial effects of CO2retention (e.g., those with evidence of increased intracranial pressure or brain tumors), ULTIVA may reduce respiratory drive, and the resultant CO2 retention can further increase intracranial pressure in spontaneously breathing patients. Monitor such patients for signs of sedation and respiratory depression, particularly when initiating therapy with ULTIVA. The remifentanil in ULTIVA may cause spasm of the sphincter of Oddi. Opioids may cause increases in serum amylase. Monitor patients with biliary tract disease, including acute pancreatitis, for worsening symptoms. The remifentanil in ULTIVA may increase the frequency of seizures in patients with seizure disorders, and may increase the risk of seizures occurring in other clinical settings associated with seizures. Monitor patients with a history of seizure disorders for worsened seizure control during ULTIVA therapy. Analgesic activity will subside within 5 to 10 minutes after discontinuation of administration of ULTIVA. However, respiratory depression may continue in some patients for up to 30 minutes after termination of infusion due to residual effects of concomitant anesthetics. Standard monitoring should be maintained in the postoperative period to ensure adequate recovery without stimulation. For patients undergoing surgical procedures where postoperative pain is generally anticipated, other analgesics should be administered prior to the discontinuation of ULTIVA. Approximately 2,770 adult patients were exposed to ULTIVA in controlled clinical studies. The frequencies of adverse events during general anesthesia with the recommended doses of ULTIVA are given in Table 11. Each patient was counted once for each type of adverse event. Does not include adverse events from cardiac studies or the neonatal study. See Tables 14, 15, and 16 for cardiac information. See Table 1 for recommended doses. Not all doses of ULTIVA were equipotent to the comparator opioid. Administration of ULTIVA in excess of the recommended dose (i.e., doses > 1 and up to 20 mcg/kg) resulted in a higher incidence of some adverse events: muscle rigidity (37%), bradycardia (12%), hypertension (4%), and tachycardia (4%). Included in the muscle rigidity incidence is chest wall rigidity (5%). The overall muscle rigidity incidence is < 1% when remifentanil is administered concurrently or after a hypnotic induction agent. Does not include adverse events from cardiac studies or the neonatal study. See Table 1 for recommended doses. Not all doses of ULTIVA were equipotent to the comparator opioid. The frequencies of adverse events from the clinical studies at the recommended doses of ULTIVA in monitored anesthesia care are given in Table 13. See Table 3 for recommended doses. Administration of ULTIVA in excess of the recommended infusion rate (i.e., starting doses > 0.1 mcg/kg/min) resulted in a higher incidence of some adverse events: nausea (60%), apnea (8%), and muscle rigidity (5%). With higher midazolam doses, higher incidences of respiratory depression and apnea were observed. Event frequencies are calculated as the number of patients who were administered ULTIVA and reported an event divided by the total number of patients exposed to ULTIVA in all controlled studies including cardiac dose-ranging and neurosurgery studies (n = 1,883 general anesthesia, n = 609 monitored anesthesia care). Metabolic and Nutrition: abnormal liver function, hyperglycemia, electrolyte disorders, increased CPK level. Hematologic and Lymphatic: anemia, lymphopenia, leukocytosis, thrombocytopenia. The frequencies of adverse events from the clinical studies at the recommended doses of ULTIVA in cardiac surgery are given in Tables 14, 15, and 16. These tables represent adverse events collected during discrete phases of cardiac surgery. Any event should be viewed as temporally associated with drug administration and the phase indicated should not be perceived as the only time the event might occur. See Table 4 for recommended doses. ULTIVA has been studied in 342 pediatric patients in controlled clinical studies for maintenance of general anesthesia. In the pediatric population (birth to 12 years), the most commonly reported events were nausea, vomiting, and shivering. The frequencies of adverse events during general anesthesia with the recommended doses of ULTIVA are given in Table 17. Each patient was counted once for each type of adverse event. There were no adverse events ≥ 1% for any treatment group during the maintenance period in the pediatric patient general anesthesia studies. See Table 2 for recommended doses. In subjects receiving halothane (n = 22), 10 (45%) experienced vomiting. Anaphylaxis: Anaphylaxis has been reported with ingredients contained in ULTIVA. Table 18 includes clinically significant drug interactions with ULTIVA. Due to additive pharmacologic effect, the concomitant use of benzodiazepines or other CNS depressants including alcohol, increases the risk of hypotension, respiratory depression, profound sedation, coma, and death. Limit dosages and durations to the minimum required. Follow patients closely for signs of respiratory depression and sedation. Patients should be advised to avoid alcohol for 24 hours after surgery [see Warnings and Precautions (5.3)]. The concomitant use of opioids with other drugs that affect the serotonergic neurotransmitter system has resulted in serotonin syndrome [see Warnings and Precautions (5.4)]. If concomitant use is warranted, carefully observe the patient, particularly during treatment initiation and dose adjustment. Discontinue ULTIVA if serotonin syndrome is suspected. MAOI interactions with opioids may manifest as serotonin syndrome [see Warnings and Precautions (5.4)] or opioid toxicity (e.g., respiratory depression, coma) [see Warnings and Precautions (5.2)]. If urgent use of ULTIVA is necessary, use test doses and frequent titration of small doses while closely monitoring blood pressure and signs and symptoms of CNS and respiratory depression. The use of ULTIVA is not recommended for patients taking MAOIs or within 14 days of stopping such treatment. May reduce the analgesic effect of ULTIVA and/or precipitate withdrawal symptoms. If concomitant use is warranted, carefully observe the patient, particularly during treatment initiation and dose adjustment. Consider discontinuing ULTIVA if patient is not responding appropriately to treatment and institute alternative analgesic treatment. Prolonged use of opioid analgesics during pregnancy may cause neonatal opioid withdrawal syndrome. Available data with remifentanil hydrochloride in pregnant women are insufficient to inform a drug-associated risk for major birth defects and miscarriage. In animal reproduction studies, reduced fetal rat body weight and pup weights were reported at 2.2 times a human intravenous infusion of an induction dose of 1 mcg/kg with a maintenance dose of 2 mcg/kg/min for a surgical procedure lasting 3 hours. There were no malformations noted when remifentanil was administered via bolus injection to pregnant rats or rabbits during organogenesis at doses approximately 5 times and approximately equal, respectively, to a human intravenous infusion of an induction dose of 1 mcg/kg with a maintenance dose of 2 mcg/kg/min for a surgical procedure lasting 3 hours [see Data]. The estimated background risk of major birth defects and miscarriage for the indicated population is unknown. All pregnancies have a background risk of birth defect, loss, or other adverse outcomes. In the U.S. general population, the estimated background risk of major birth defects and miscarriage in clinically recognized pregnancies is 2-4% and 15-20%, respectively. Opioids cross the placenta and may produce respiratory depression and psycho-physiologic effects in neonates. An opioid antagonist, such as naloxone, must be available for reversal of opioid-induced respiratory depression in the neonate. ULTIVA is not recommended for use in pregnant women during or immediately prior to labor, when other analgesic techniques are more appropriate. Opioid analgesics, including ULTIVA, can prolong labor through actions which temporarily reduce the strength, duration, and frequency of uterine contractions. However, this effect is not consistent and may be offset by an increased rate of cervical dilation, which tends to shorten labor. Monitor neonates exposed to opioid analgesics during labor for signs of excess sedation and respiratory depression. It is not known whether remifentanil is excreted in human milk. After receiving radioactive-labeled remifentanil, the radioactivity was present in the milk of lactating rats. Because fentanyl analogs are excreted in human milk, caution should be exercised when ULTIVA is administered to a nursing woman. The developmental and health benefits of breastfeeding should be considered along with the mother’s clinical need for ULTIVA and any potential adverse effects on the breastfed infant from ULTIVA or from the underlying maternal condition. Infants exposed to ULTIVA through breast milk should be monitored for excess sedation and respiratory depression. Withdrawal symptoms can occur in breastfed infants when maternal administration of an opioid analgesic is stopped, or when breast-feeding is stopped. The efficacy and safety of ULTIVA as an analgesic agent for use in the maintenance of general anesthesia in outpatient and inpatient pediatric surgery have been established in controlled clinical studies in pediatric patients from birth to 12 years [see Clinical Studies (14.4)]. ULTIVA has not been studied in pediatric patients for use as a postoperative analgesic or as an analgesic component of monitored anesthesia care. No data are available on the long-term (longer than 16 hours) use of ULTIVA as an analgesic in ICU patients. ULTIVA contains remifentanil, a Schedule II controlled substance. ULTIVA is a Schedule II controlled drug substance that can produce drug dependence of the morphine type and has the potential for being abused. ULTIVA contains remifentanil, a substance with a high potential for abuse similar to other opioids including fentanyl, alfentanil, sufentanil, and meperidine. ULTIVA can be abused and is subject to misuse, addiction, and criminal diversion. ULTIVA, like other opioids, can be diverted for non-medical use into illicit channels of distribution. Careful record-keeping of prescribing information, including quantity, frequency, and renewal requests, as required by state and federal law, is strongly advised. Abuse of ULTIVA poses a risk of overdose and death. The risk is increased with concurrent use of ULTIVA with alcohol and other central nervous system depressants. Acute overdose with ULTIVA can be manifested by respiratory depression, somnolence progressing to stupor or coma, skeletal muscle flaccidity, cold and clammy skin, constricted pupils, and, in some cases, pulmonary edema, bradycardia, hypotension, partial or complete airway obstruction, atypical snoring, and death. Marked mydriasis rather than miosis may be seen with hypoxia in overdose situations [see Clinical Pharmacology (12.2)]. ULTIVA (remifentanil hydrochloride) for injection is an opioid agonist. The chemical name is 3-[4-methoxycarbonyl-4-[(1-oxopropyl)phenylamino]-1-piperidine]propanoic acid methyl ester, hydrochloride salt. The molecular weight is 412.91. Its molecular formula is C20H28N2O5•HCl, and it has the following chemical structure. ULTIVA is a sterile, nonpyrogenic, preservative-free, white to off-white lyophilized powder for intravenous (IV) administration after reconstitution and dilution. Each vial contains 1 mg, 2 mg, or 5 mg of remifentanil base; 15 mg glycine; and hydrochloric acid to buffer the solutions to a nominal pH of 3 after reconstitution. When reconstituted as directed, solutions of ULTIVA are clear and colorless and contain remifentanil hydrochloride (HCl) equivalent to 1 mg/mL of remifentanil base. The pH of reconstituted solutions of ULTIVA ranges from 2.5 to 3.5. 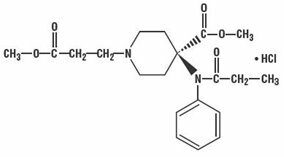 Remifentanil hydrochloride has a pKa of 7.07. Remifentanil hydrochloride has an n-octanol:water partition coefficient of 17.9 at pH 7.3. ULTIVA is a µ-opioid agonist with rapid onset and peak effect, and short duration of action. The µ-opioid activity of ULTIVA is antagonized by opioid antagonists such as naloxone. Unlike other opioids, ULTIVA is rapidly metabolized by hydrolysis of the propanoic acid-methyl ester linkage by nonspecific blood and tissue esterases. ULTIVA is not a substrate for plasma cholinesterase (pseudocholinesterase) and, therefore, patients with atypical cholinesterase are expected to have a normal duration of action. The analgesic effects of ULTIVA are rapid in onset and offset. Its effects and side effects are dose dependent and similar to other µ-opioids. ULTIVA in humans has a rapid blood-brain equilibration half-time of 1 ± 1 minutes (mean ± SD) and a rapid onset of action. The pharmacodynamic effects of ULTIVA closely follow the measured blood concentrations, allowing direct correlation between dose, blood levels, and response. Blood concentration decreases 50% in 3 to 6 minutes after a 1-minute infusion or after prolonged continuous infusion due to rapid distribution and elimination processes and is independent of duration of drug administration. Recovery from the effects of ULTIVA occurs rapidly (within 5 to 10 minutes). New steady-state concentrations occur within 5 to 10 minutes after changes in infusion rate. When used as a component of an anesthetic technique, ULTIVA can be rapidly titrated to the desired depth of anesthesia/analgesia (e.g., as required by varying levels of intraoperative stress) by changing the continuous infusion rate or by administering an IV bolus injection. Remifentanil causes miosis, even in total darkness. Pinpoint pupils are a sign of opioid overdose but are not pathognomonic (e.g., pontine lesions of hemorrhagic or ischemic origins may produce similar findings). Marked mydriasis rather than miosis may be seen due to hypoxia in overdose situations. There is a relationship between increasing remifentanil plasma concentration and increasing frequency of dose-related opioid adverse reactions such as nausea, vomiting, CNS effects, and respiratory depression. In opioid-tolerant patients, the situation may be altered by the development of tolerance to opioid-related adverse reactions [see Dosage and Administration (2.1, 2.2)]. In premedicated patients undergoing anesthesia, 1-minute infusions of < 2 mcg/kg of ULTIVA cause dose-dependent hypotension and bradycardia. While additional doses > 2 mcg/kg (up to 30 mcg/kg) do not produce any further decreases in heart rate or blood pressure, the duration of the hemodynamic change is increased in proportion to the blood concentrations achieved. Peak hemodynamic effects occur within 3 to 5 minutes of a single dose of ULTIVA or an infusion rate increase. Glycopyrrolate, atropine, and vagolytic neuromuscular blocking agents attenuate the hemodynamic effects associated with ULTIVA. When appropriate, bradycardia and hypotension can be reversed by reduction of the rate of infusion of ULTIVA, or the dose of concurrent anesthetics, or by the administration of fluids or vasopressors. ULTIVA depresses respiration in a dose-related fashion. Unlike other fentanyl analogs, the duration of action of ULTIVA at a given dose does not increase with increasing duration of administration, due to lack of drug accumulation. 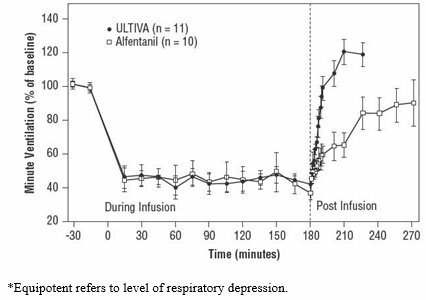 When ULTIVA and alfentanil were dosed to equal levels of respiratory depression, recovery of respiratory drive after 3-hour infusions was more rapid and less variable with ULTIVA (see Figure 1). Skeletal muscle rigidity can be caused by ULTIVA and is related to the dose and speed of administration. ULTIVA may cause chest wall rigidity (inability to ventilate) after single doses of > 1 mcg/kg administered over 30 to 60 seconds or infusion rates > 0.1 mcg/kg/min; peripheral muscle rigidity may occur at lower doses. Administration of doses < 1 mcg/kg may cause chest wall rigidity when given concurrently with a continuous infusion of ULTIVA. Assays of histamine in patients and normal volunteers have shown no elevation in plasma histamine levels after administration of ULTIVA in doses up to 30 mcg/kg over 60 seconds. ULTIVA is synergistic with the activity of hypnotics (propofol and thiopental), inhaled anesthetics, and benzodiazepines [see Clinical Studies (14.1), Warnings and Precautions (5), and Dosage and Administration (2)]. The pharmacodynamic activity of ULTIVA (as measured by the EC50 for development of delta waves on the EEG) increases with increasing age. The EC50 of remifentanil for this measure was 50% less in patients over 65 years of age when compared to healthy volunteers (25 years of age) [see Dosage and Administration (2.2)]. No differences have been shown in the pharmacodynamic activity (as measured by the EEG) of ULTIVA between men and women. There was no change in intraocular pressure after the administration of ULTIVA prior to ophthalmic surgery under monitored anesthesia care. Under isoflurane-nitrous oxide anesthesia (PaCO2 < 30 mmHg), a 1-minute infusion of ULTIVA (0.5 or 1.0 mcg/kg) produced no change in intracranial pressure. Mean arterial pressure and cerebral perfusion decreased as expected with opioids. In patients receiving ULTIVA and nitrous oxide anesthesia, cerebrovascular reactivity to carbon dioxide remained intact. In humans, no epileptiform activity was seen on the EEG (n = 44) at remifentanil doses up to 8 mcg/kg/min. The pharmacodynamics of ULTIVA (ventilatory response to hypercarbia) are unaltered in patients with end stage renal disease (creatinine clearance < 10 mL/min). The pharmacodynamics of ULTIVA (ventilatory response to hypercarbia) are unaltered in patients with severe hepatic dysfunction awaiting liver transplant. After IV doses administered over 60 seconds, the pharmacokinetics of remifentanil fit a three-compartment model with a rapid distribution half-life of one minute, a slower distribution half-life of 6 minutes, and a terminal elimination half-life of 10 to 20 minutes. Since the terminal elimination component contributes less than 10% of the overall area under the concentration versus time curve (AUC), the effective biological half-life of ULTIVA is 3 to 10 minutes. This is similar to the 3- to 10-minute half-life measured after termination of prolonged infusions (up to 4 hours; see Figure 2) and correlates with recovery times observed in the clinical setting after infusions up to 12 hours. Concentrations of remifentanil are proportional to the dose administered throughout the recommended dose range. The pharmacokinetics of remifentanil are unaffected by the presence of renal or hepatic impairment. The pharmacokinetic profile of ULTIVA is not changed in patients with end stage renal disease (creatinine clearance < 10 mL/min). In anephric patients, the half-life of the carboxylic acid metabolite increases from 90 minutes to 30 hours. The metabolite is removed by hemodialysis with a dialysis extraction ratio of approximately 30%. Mutagenicity was observed with remifentanil in the in vitro mouse lymphoma assay in the presence but not absence of metabolic activation.Remifentanil did not induce gene mutation in the in vitro bacterial reverse mutation assay (Ames test) and was not genotoxic in the in vivo rat hepatocyte unscheduled DNA synthesis assay. No clastogenic effect was seen in cultured Chinese hamster ovary cells or in the in vivo mouse micronucleus test. ULTIVA was evaluated in 3,341 patients undergoing general anesthesia (n = 2,706) and monitored anesthesia care (n = 639). These patients were evaluated in the following settings: inpatient (n = 2,079) which included cardiovascular (n = 426), and neurosurgical (n = 61), and outpatient (n = 1,349). Four-hundred and eighty-six (486) elderly patients (age range 66 to 90 years) and 410 pediatric patients (age range birth to 12 years) received ULTIVA. Of the general anesthesia patients, 682 also received ULTIVA as an IV analgesic agent during the immediate postoperative period. The efficacy of ULTIVA was investigated in 1,562 patients in 15 randomized, controlled trials as the analgesic component for the induction and maintenance of general anesthesia. Eight of these studies compared ULTIVA to alfentanil and two studies compared ULTIVA to fentanyl. In these studies, doses of ULTIVA up to the ED90 were compared to recommended doses (approximately ED50) of alfentanil or fentanyl. ULTIVA was administered with isoflurane, propofol, or thiopental for the induction of anesthesia (n = 1,562). The majority of patients (80%) received propofol as the concurrent agent. ULTIVA reduced the propofol and thiopental requirements for loss of consciousness. Compared to alfentanil and fentanyl, a higher relative dose of ULTIVA resulted in fewer responses to intubation (see Table 19). Overall, hypotension occurred in 5% of patients receiving ULTIVA compared to 2% of patients receiving the other opioids. ULTIVA has been used as a primary agent for the induction of anesthesia; however, it should not be used as a sole agent because loss of consciousness cannot be assured and because of a high incidence of apnea, muscle rigidity, and tachycardia. The administration of an induction dose of propofol or thiopental or a paralyzing dose of a muscle relaxant prior to or concurrently with ULTIVA during the induction of anesthesia markedly decreased the incidence of muscle rigidity from 20% to < 1%. Propofol was titrated to loss of consciousness. Not all doses of ULTIVA were equipotent to the comparator opioid. Differences were statistically significant ( P < 0.02). Initial doses greater than 1 mcg/kg are not recommended. ULTIVA was investigated in 929 patients in seven well controlled general surgery studies in conjunction with nitrous oxide, isoflurane, or propofol in both inpatient and outpatient settings. These studies demonstrated that ULTIVA could be dosed to high levels of opioid effect and rapidly titrated to optimize analgesia intraoperatively without delaying or prolonging recovery. Compared to alfentanil and fentanyl, these higher relative doses (ED90) of ULTIVA resulted in fewer responses to intraoperative stimuli (see Table 20) and a higher frequency of hypotension (16% compared to 5% for the other opioids). ULTIVA was infused to the end of surgery, while alfentanil was discontinued 5 to 30 minutes before the end of surgery as recommended. The mean final infusion rates of ULTIVA were between 0.25 and 0.48 mcg/kg/min. Not all doses of ULTIVA were equipotent to the comparator opioid. Differences were statistically significant ( P < 0.05). In three randomized, controlled studies (n = 407) during general anesthesia, ULTIVA attenuated the signs of light anesthesia within a median time of 3 to 6 minutes after bolus doses of 1 mcg/kg with or without infusion rate increases of 50% to 100% (up to a maximum rate of 2 mcg/kg/min). In an additional double-blind, randomized study (n = 103), a constant rate (0.25 mcg/kg/min) of ULTIVA was compared to doubling the rate to 0.5 mcg/kg/min approximately 5 minutes before the start of the major surgical stress event. Doubling the rate decreased the incidence of signs of light anesthesia from 67% to 8% in patients undergoing abdominal hysterectomy, and from 19% to 10% in patients undergoing radical prostatectomy. In patients undergoing laminectomy the lower dose was adequate. In 2,169 patients receiving ULTIVA for periods up to 16 hours, recovery from anesthesia was rapid, predictable, and independent of the duration of the infusion of ULTIVA. In the seven controlled, general surgery studies, extubation occurred in a median of 5 minutes (range: -3 to 17 minutes in 95% of patients) in outpatient anesthesia and 10 minutes (range: 0 to 32 minutes in 95% of patients) in inpatient anesthesia. Recovery in studies using nitrous oxide or propofol was faster than in those using isoflurane as the concurrent anesthetic. There was no case of remifentanil-induced delayed respiratory depression occurring more than 30 minutes after discontinuation of remifentanil [see Warnings and Precautions (5.14)]. Two randomized, dose-ranging studies (n = 127) examined the administration of ULTIVA to outpatients undergoing general anesthesia with a laryngeal mask. Starting infusion rates of ULTIVA of ≤ 0.05 mcg/kg/min provided supplemental analgesia while allowing spontaneous ventilation with propofol or isoflurane. Bolus doses of ULTIVA during spontaneous ventilation lead to transient periods of apnea, respiratory depression, and muscle rigidity. ULTIVA has been evaluated for maintenance of general anesthesia in 410 pediatric patients from birth to 12 years undergoing inpatient and outpatient procedures. Four clinical studies have been performed. Study 1, an open-label, randomized, controlled clinical trial (n = 129), compared ULTIVA (n = 68) with alfentanil (n = 19), isoflurane (n = 22), or propofol (n = 20) in children 2 to 12 years of age undergoing strabismus surgery. After induction of anesthesia which included the administration of atropine, ULTIVA was administered as an initial infusion of 1 mcg/kg/min with 70% nitrous oxide. The infusion rate required during maintenance of anesthesia was 0.73 to 1.95 mcg/kg/min. Time to extubation and to purposeful movement was a median of 10 minutes (range 1 to 24 minutes). Study 2, a double-blind, randomized, controlled trial (n = 222), compared ULTIVA (n = 119) to fentanyl (n = 103) in children 2 to 12 years of age undergoing tonsillectomy with or without adenoidectomy. After induction of anesthesia, patients received a 0.25 mcg/kg/min infusion of ULTIVA or fentanyl by IV bolus with nitrous oxide/oxygen (2:1) and either halothane or sevoflurane for maintenance of anesthesia. The mean infusion rate required during maintenance of anesthesia was 0.3 mcg/kg/min (range 0.2 to 1.3 mcg/kg/min). The continuous infusion rate was decreased to 0.05 mcg/kg/min approximately 10 minutes prior to the end of surgery. Time to spontaneous purposeful movement was a median of 8 minutes (range 1 to 19 minutes). Time to extubation was a median of 9 minutes (range 2 to 19 minutes). Study 3, an open-label, randomized, controlled trial (n = 271), compared ULTIVA (n = 185) with a regional anesthetic technique (n = 86) in children 1 to 12 years of age undergoing major abdominal, urological, or orthopedic surgery. Patients received a 0.25 mcg/kg/min infusion of ULTIVA following a 1.0 mcg/kg bolus or bupivacaine by epidural infusion, along with isoflurane and nitrous oxide after the induction of anesthesia. The mean infusion rate required during maintenance of anesthesia was 0.25 mcg/kg/min (range 0 to 0.75 mcg/kg/min). Both treatments were effective in attenuating responses to skin incision during surgery. The hemodynamic profile of the ULTIVA group was consistent with an opioid-based general anesthetic technique. Time to spontaneous purposeful movement was a median of 15 minutes (range, 2 to 75 minutes) in the remifentanil group. Time to extubation was a median of 13 minutes (range, 4 to 31 minutes) in the remifentanil group. Study 4, an open-label, randomized, controlled trial (n = 60), compared ULTIVA (n = 38) with halothane (n = 22) in ASA 1 or 2, full term neonates and infants ≤ 8 weeks of age weighing at least 2500 grams who were undergoing pyloromyotomy. After induction of anesthesia, which included the administration of atropine, patients received 0.4 mcg/kg/min of ULTIVA or 0.4% halothane with 70% nitrous oxide for initial maintenance of anesthesia and then both agents were adjusted according to clinical response. Bolus doses of 1 mcg/kg administered over 30 to 60 seconds were used to treat brief episodes of hypertension and tachycardia, and infusion rates were increased by 50% to treat sustained hypertension and tachycardia. The range of infusion rates of ULTIVA required during maintenance of anesthesia was 0.4 to 1 mcg/kg/min. Seventy-one percent (71%) of ULTIVA patients required supplementary boluses or rate increases from the starting dose of 0.4 mcg/kg/min to treat hypertension, tachycardia, movement or somatic signs of light anesthesia. Twenty-four percent of the patients required an increase from the initial rate of 0.4 mcg/kg/min prior to incision and 26% of patients required an infusion rate between 0.8 and 1.0 mcg/kg/min, most often during gastric manipulation. The continuous infusion rate was decreased to 0.05 mcg/kg/min approximately 10 minutes before the end of surgery. In the ULTIVA group, median time from discontinuation of anesthesia to spontaneous purposeful movement was 6.5 minutes (range, 1 to 13 minutes) and median time to extubation was 8.5 minutes (range, 1 to 14 minutes). No pediatric patients receiving ULTIVA required naloxone during the immediate postoperative recovery period. ULTIVA was originally administered to 225 subjects undergoing elective CABG surgery in two dose-ranging studies without active comparators. Subsequently, two double-blind, double-dummy clinical studies (N = 426) evaluated ULTIVA (n = 236) at recommended doses versus active comparators (n = 190). The first comparator study, a multi-center, randomized, double-blind, double-dummy, parallel-group study (N = 369), compared ULTIVA (n = 201) with fentanyl (n = 168) in adult patients undergoing elective CABG surgery. Subjects received 1 to 3 mg midazolam and 0.05 mg/kg morphine IV as premedication. Anesthesia was induced with propofol 0.5 mg/kg (higher doses administered with ULTIVA were associated with excessive hypotension) over one minute plus 10-mg boluses every 10 seconds until loss of consciousness followed by either cisatracurium 0.2 mg/kg or vecuronium 0.15 mg/kg. Patients randomized to ULTIVA received a 1 mcg/kg/min infusion of ULTIVA followed by a placebo bolus administered over 3 minutes. In the active control group, a placebo IV infusion was started and a fentanyl bolus 10 mcg/kg was administered over 3 minutes. All subjects received isoflurane titrated initially to end tidal concentration of 0.5%. During maintenance, the group randomized to ULTIVA received as needed 0.5-1 mcg/kg/min IV rate increases (to a maximum of 4 mcg/kg/min) of ULTIVA and 1 mcg/kg IV boluses of ULTIVA. The active control group received 2 mcg/kg IV boluses of fentanyl and increases in placebo IV infusion rate. The second comparator study, a multi-center, double-blind, randomized, parallel group study (N = 57), compared ULTIVA (n = 35) to fentanyl (n = 22) in adult patients undergoing elective CABG surgery with poor left ventricular function (ejection fraction < 0.35). Subjects received oral lorazepam 40 mcg/kg as premedication. Anesthesia was induced using etomidate until loss of consciousness, followed by a low-dose propofol infusion (3 mg/kg/hr) and pancuronium 0.15 mg/kg. Subjects in the group administered ULTIVA received a placebo bolus dose and a continuous infusion of ULTIVA 1 mcg/kg/min and subjects in the fentanyl group received a bolus loading dose of 15 mcg/kg and placebo continuous infusion. During maintenance, supplemental bolus doses of ULTIVA (0.5 mcg/kg) and infusion rate increases of 0.5 to 1 mcg/kg/min (maximum rate allowed was 4 mcg/kg/min) of ULTIVA were administered to one group; while the fentanyl group was given intermittent maintenance bolus doses of 2 mcg/kg and increases in the placebo infusion rate. In these two studies, using a high dose opioid technique with ULTIVA as a component of a balanced or total intravenous anesthetic regimen, the remifentanil regimen effectively attenuated response to maximal sternal spread generally better than the dose and regimen studied for the active control (fentanyl). While this provides evidence for the efficacy of remifentanil as an analgesic in this setting, caution must be exercised in interpreting these results as evidence of superiority of remifentanil over the active control, since these studies did not make any attempt to evaluate and compare the optimal analgesic doses of either drug in this setting. ULTIVA was administered to 61 patients undergoing craniotomy for removal of a supratentorial mass lesion. In these studies, ventilation was controlled to maintain a predicted PaCO2 of approximately 28 mmHg. In one study (n = 30) with ULTIVA and 66% nitrous oxide, the median time to extubation and to patient response to verbal commands was 5 minutes (range -1 to 19 minutes). Intracranial pressure and cerebrovascular responsiveness to carbon dioxide were normal [see Clinical Pharmacology (12.2)]. A randomized, controlled study compared ULTIVA (n = 31) to fentanyl (n = 32). ULTIVA (1 mcg/kg/min) and fentanyl (2 mcg/kg/min) were administered after induction with thiopental and pancuronium. A similar number of patients (6%) receiving ULTIVA and fentanyl had hypotension during induction. Anesthesia was maintained with nitrous oxide and ULTIVA at a mean infusion rate of 0.23 mcg/kg/min (range 0.1 to 0.4) compared with a fentanyl mean infusion rate of 0.04 mcg/kg/min (range 0.02 to 0.07). Supplemental isoflurane was administered as needed. The patients receiving ULTIVA required a lower mean isoflurane dose (0.07 MAC-hours) compared with 0.64 MAC-hours for the fentanyl patients (P = 0.04). ULTIVA was discontinued at the end of anesthesia, whereas fentanyl was discontinued at the time of bone flap replacement (a median time of 44 minutes before the end of surgery). Median time to extubation was similar (5 and 3.5 minutes, respectively, with ULTIVA and fentanyl). None of the patients receiving ULTIVA required naloxone compared to seven of the fentanyl patients (P = 0.01). Eighty-one percent (81%) of patients receiving ULTIVA recovered (awake, alert, and oriented) within 30 minutes after surgery compared with 59% of fentanyl patients (P = 0.06). At 45 minutes, recovery rates were similar (81% and 69% respectively for ULTIVA and fentanyl, P = 0.27). Patients receiving ULTIVA required an analgesic for headache sooner than fentanyl patients (median of 35 minutes compared with 136 minutes, respectively [P = 0.04]). No adverse cerebrovascular effects were seen in this study [see Clinical Pharmacology (12.2)]. Analgesia with ULTIVA in the immediate postoperative period (until approximately 30 minutes after extubation) was studied in 401 patients in four dose-finding studies and in 281 patients in two efficacy studies. In the dose-finding studies, the use of bolus doses of ULTIVA and incremental infusion rate increases ≥ 0.05 mcg/kg/min led to respiratory depression and muscle rigidity. In two efficacy studies, ULTIVA 0.1 mcg/kg/min was started immediately after discontinuing anesthesia. Incremental infusion rate increases of 0.025 mcg/kg/min every 5 minutes were given to treat moderate to severe postoperative pain. In Study 1, 50% decreases in infusion rate were made if respiratory rate decreased below 12 breaths/min and in Study 2, the same decreases were made if respiratory rate was below 8 breaths/min. With this difference in criteria for infusion rate decrease, the incidence of respiratory depression was lower in Study 1 (4%) than in Study 2 (12%). In both studies, ULTIVA provided effective analgesia (no or mild pain with respiratory rate ≥ 8 breaths/min) in approximately 60% of patients at mean final infusion rates of 0.1 to 0.125 mcg/kg/min. Study 2 was a double-blind, randomized, controlled study in which patients received either morphine sulfate (0.15 mg/kg administered 20 minutes before the anticipated end of surgery plus 2 mg bolus doses for supplemental analgesia) or ULTIVA (as described above). Emergence from anesthesia was similar between groups; median time to extubation was 5 to 6 minutes for both. ULTIVA provided effective analgesia in 58% of patients compared to 33% of patients who received morphine. Respiratory depression occurred in 12% of patients receiving ULTIVA compared to 4% of morphine patients. For patients who received ULTIVA, morphine sulfate (0.15 mg/kg) was administered in divided doses 5 and 10 minutes before discontinuing ULTIVA. Within 30 minutes after discontinuation of ULTIVA, the percentage of patients with effective analgesia decreased to 34%. ULTIVA has been studied in the monitored anesthesia care setting in 609 patients in eight clinical studies. Nearly all patients received supplemental oxygen in these studies. Two early dose-finding studies demonstrated that use of sedation as an endpoint for titration of ULTIVA led to a high incidence of muscle rigidity (69%) and respiratory depression. Subsequent trials titrated ULTIVA to specific clinical endpoints of patient comfort, analgesia, and adequate respiration (respiratory rate > 8 breaths/min) with a corresponding lower incidence of muscle rigidity (3%) and respiratory depression. With doses of midazolam > 2 mg (4 to 8 mg), the dose of ULTIVA could be decreased by 50%, but the incidence of respiratory depression rose to 32%. The efficacy of a single dose of ULTIVA (1.0 mcg/kg over 30 seconds) was compared to alfentanil (7 mcg/kg over 30 seconds) in patients undergoing ophthalmic surgery. More patients receiving ULTIVA were pain free at the time of the nerve block (77% versus 44%, P = 0.02) and more experienced nausea (12% versus 4%) than those receiving alfentanil. In a randomized, controlled study (n = 118), ULTIVA 0.5 mcg/kg over 30 to 60 seconds followed by a continuous infusion of 0.1 mcg/kg/min, was compared to a propofol bolus (500 mcg/kg) followed by a continuous infusion (50 mcg/kg/min) in patients who received a local or regional anesthetic nerve block 5 minutes later. The incidence of moderate or severe pain during placement of the block was similar between groups (2% with ULTIVA and 8% with propofol, P = 0.2) and more patients receiving ULTIVA experienced nausea (26% versus 2%, P < 0.001). The final mean infusion rate of ULTIVA was 0.08 mcg/kg/min. In a randomized, double-blind study, ULTIVA with or without midazolam was evaluated in 159 patients undergoing superficial surgical procedures under local anesthesia. ULTIVA was administered without midazolam as a 1 mcg/kg dose over 30 seconds followed by a continuous infusion of 0.1 mcg/kg/min. In the group of patients that received midazolam, ULTIVA was administered as a 0.5 mcg/kg dose over 30 seconds followed by a continuous infusion of 0.05 mcg/kg/min and midazolam 2 mg was administered 5 minutes later. The occurrence of moderate or severe pain during the local anesthetic injection was similar between groups (16% and 20%). Other effects for ULTIVA alone and ULTIVA/midazolam were: respiratory depression with oxygen desaturation (SPO2 < 90%), 5% and 2%; nausea, 8% and 2%; and pruritus, 23% and 12%. Titration of ULTIVA resulted in prompt resolution of respiratory depression (median 3 minutes, range 0 to 6 minutes). The final mean infusion rate of ULTIVA was 0.12 mcg/kg/min (range 0.03 to 0.3) for the group receiving ULTIVA alone and 0.07 mcg/kg/min (range 0.02 to 0.2) for the group receiving ULTIVA/midazolam. ULTIVA should be stored at 2° to 25°C (36° to 77°F). ULTIVA ® is a registered trademark of Glaxo Group Limited. Diprivan® is a registered trademark of Fresenius Kabi USA, LLC. Store at 2° to 25°C (36° to 77°F). per mg of remifentanil. Shake well to dissolve. 50 or 250 mcg/mL prior to administration. without dilution. See package insert.